Maincor 1 – 12 port UFH Manifolds are supplied complete with flowmeters for ease of commissioning. Also included within the manifold arrangement are fill and drain ports, automatic air vents and fixing brackets. 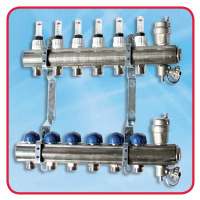 Requires pipe connectors and ball valves, both are sold separately.